Buy boots that suit you – There is a saying: “It is not about the boots, it is about the player.” This true to certain extent. Although a special set of soccer footwear will not make you a better player, buying cleats that work for you, will help you take your game to the next level. Playing style – Buy cleats that suit your playing style. Every player has his playing style, and it is a good idea to get a pair of boots that suit it. 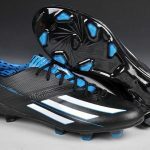 For example, wingers need lightweight boots for quick acceleration and fast changes of direction. Pitch condition – Choose cleats based on the playing surface. There is no point buying hard ground boots when you will play mostly on web muddy pitches. Think about the surfaces you will play during the season. If there are variable conditions, then you might need more than one pair. The main point here is to avoid buying a pair of cleats because your favorite player wears them. Buy a pair that suits you, your playing style and where you will play.